This recipe was entered in the contest for Your Best Party Drink. I came up with this recipe to go with a pork dinner, when our sage bush was going wild. It’s fruity but not too sweet, summery but sophisticated. It pairs well with figs, dates, pesto, & pork. It’s also lovely, light, & summery as a non-alcoholic spritzer: Just omit the grappa and add more simple syrup and seltzer. Bring water almost to a boil. Add sugar and then sage leaves. Heat mixture, stirring until the sugar dissolves completely. Pour grappa and sage simple syrup into punchbowl. Clap the sage– clap it between your hands once to bruise it & release it’s sage-y goodness. 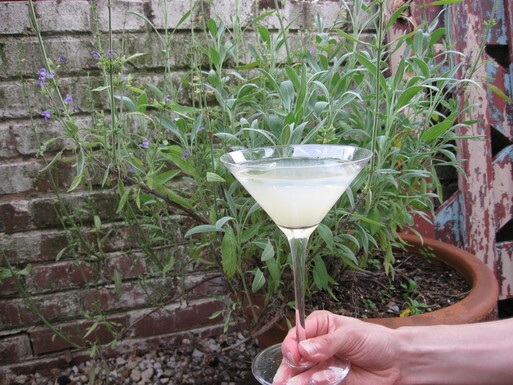 Serve with a splash of selzter, and float the clapped sage on top as an aromatic garnish.